Make them laugh, and they're yours forever . . .
Barbara Parker is Miss Blackpool of 1964, but she doesn't want to be a beauty queen. She only wants to make people laugh. So she leaves her hometown behind, takes herself off to London, and lands a life-changing audition for a new BBC comedy series. Overnight she becomes Sophie Straw: charming, gorgeous, destined to win the nation's hearts. Funny Girl is the story of a smash-hit TV show and the people behind the scenes: the writers, Tony and Bill, friends since national service and comedy obsessives; producer Dennis, Oxbridge educated, clever, mild and not-so-secretly devoted to his star actress Sophie; and dashing male lead Clive, who firmly believes he's destined for better things. The show's success continues rocketing and the cast and crew are having the time of their lives. But when the script begins to get a bit too close to home, and life starts imitating art, they all face a choice. How long can they keep going before it's time to change the channel? 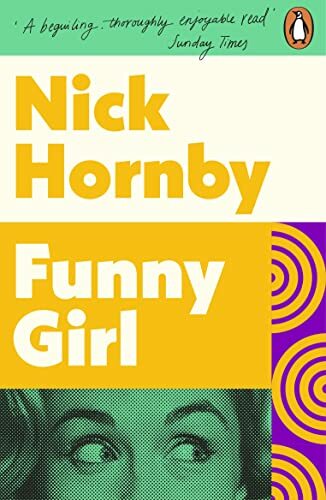 Nick Hornby's novel is about popular culture and the swinging sixties. Sophie Straw is learning about youth and old age, fame and hard work, class and collaboration. Funny Girl offers a captivating portrait of youthful exuberance and freedom at a time when Britain itself was experiencing one of its most enduring creative bursts. Hornby fans will love his latest book, as will readers of David Nicholls, Mark Haddon and William Boyd. Five minutes after being crowned Miss Blackpool 1964, Barbara Parker has ditched the tiara and is off to London to make her fortune. A chance encounter, a shrewd change of name and one audition later sees Sophie Straw with her own BBC comedy series - and there the trouble starts.